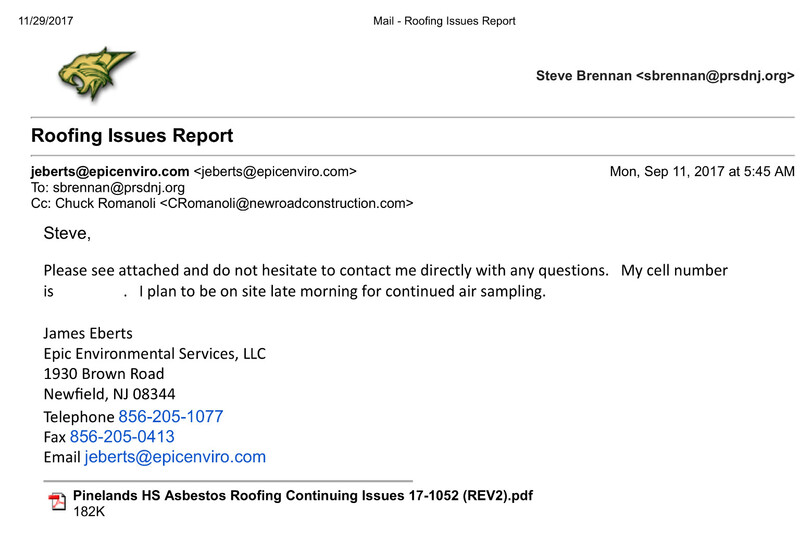 Epic Environmental’s September 10th letter informed the district that the old roofing material was never cleaned off before the new roof was applied – the new roofing material was applied directly on top of dust and debris, much of the containing asbestos. There is evidence from July 26th demonstrating that at least some of this “encapsulation” was done intentionally. Because of this, Epic urged in this letter that “rooftop activities cease immediately.” Despite the recommendation, the new roof was completely stripped and then re-applied while the school was occupied. 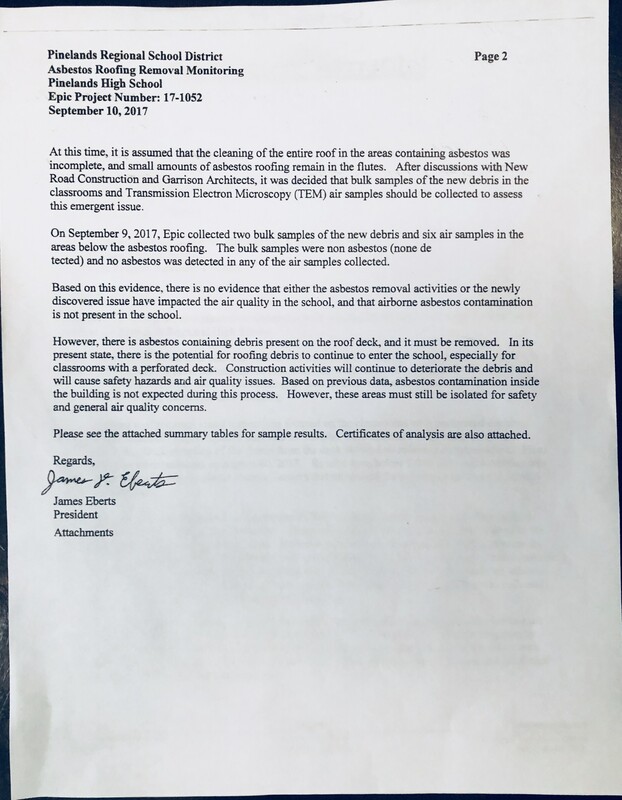 Unfortunately, neither parents nor the majority of the elected members of the Board of Education discovered this letter until October 3rd, after students and staff had been exposed to harmful dust and vapors for three straight weeks. UPDATE 12/19/2017: A new and slightly different version of the September 10th letter, dated September 29th, was discovered on December 19th. This will be updated as new information is received. If you have a suggestion on improving this, please leave a comment or get in touch. I became aware of the procedures and results of testing late afternoon on Sunday, September 10 through a phone call I received from Brooks Garrison, Chuck Romanoli and Jim Eberts…. During his presentation, Mr. Eberts asked if I received his report dated September 10, 2017. I confirmed receipt of the same and informed him, members of the Board and contractors in attendance at the executive meeting that I would post the September 10, 2017 report of Epic Environmental on the School District’s website as is my practice concerning air quality tests and other reports related to construction. 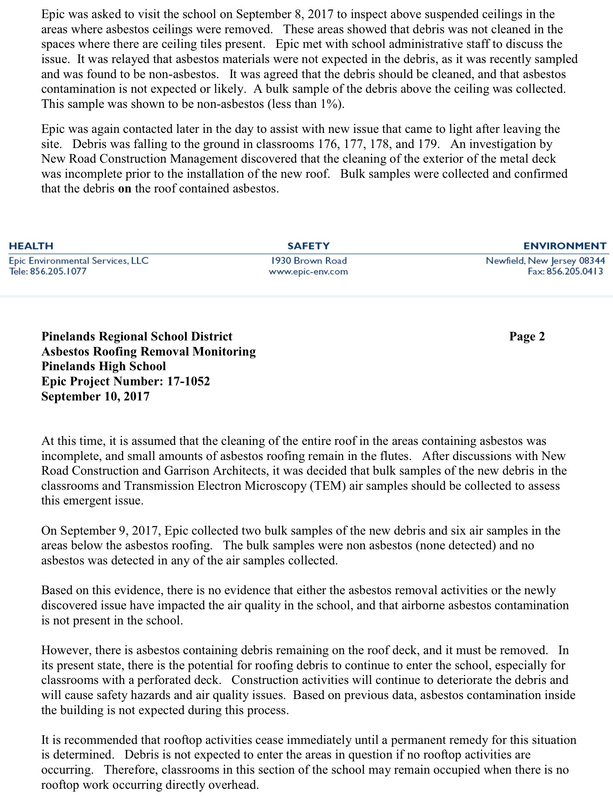 Epic Environmental’s report of September 10, 2017 was posted to the Pinelands Regional website on September 15, 2017. It was not until October third that this letter was discovered by parents. On that day, parent Erika Lee Kovak discovered the letter on the district’s website and posted a screenshot (of page two only – the page containing the critical recommendations) on Facebook. Six of the nine elected members of the Board of Education members confirmed that they were not aware of the letter or its recommendations until they saw the screenshot on Facebook on October third. Board member Jeff Bonicky stated that he learned about the letter around September 20th. Former Interim Superintendent Maryann Banks went on vacation starting on around October 2nd, 2017 (the day before parents discovered the letter). Banks stated at the October 30th construction meeting that she was not aware of Epic’s September tenth letter until around October 17th, after she returned. The Acting Superintendent during that time was Dr. Cheryl Stevenson. Her first day on duty was October second. She shut the High School down during the October second Board meeting, after hearing staff coomplaints. Note that this was the day before the letter was discovered. Stevenson is once again the Acting Superintendent now that Banks has resigned. These areas showed that debris was not cleaned in the spaces where there are ceiling tiles present…. Debris was falling to the ground in classrooms 176, 177, 178, and 179. An investigation by New Road Construction Management discovered that the cleaning of the exterior of the metal deck was incomplete prior to the installation of the new roof. At this time, it is assumed that the cleaning of the entire roof in the areas containing asbestos was incomplete, and small amounts of asbestos roofing remain in the flutes. [Although no asbestos was found in the classrooms], there is asbestos containing debris remaining on the roof deck, and it must be removed. In its present state, there is the potential for roofing debris to continue to enter the school, especially for classrooms with a perforated deck [due to holes left by decaying or broken screws]. Construction activities will continue to deteriorate the debris and will cause safety hazards and air quality issues. It is recommended that rooftop activities cease immediately until a permanent remedy for this situation is determined. Debris is not expected to enter the areas in question if no rooftop activities are occurring. Therefore, classrooms in this section of the school may remain occupied when there is no rooftop work occurring directly overhead. As [high school parent Dane] Apgar stated, it does not matter how the September 10th letter is interpreted. Having students and staff in school during construction is not just in defiance of their own consultants’ recommendation. It is also a clear violation of the contract — a contract, Apgar pointed out, that was signed exclusively by Brennan. Apgar stated that, in no less than three places, the contract stipulates that construction may not occur while the building is occupied. Here is its strongest condition to this effect, which is found on page 295: “All roof work shall be conducted… in no case while students or faculty are in the building.” Importantly, this condition does not provide any leeway. If students or staff are anywhere in the building, construction may not occur anywhere in (or on) the building. Citizens’ Media TV exclusively obtained this letter from Todd Nugent, who received it from an anonymous attendee of the November 14th meeting. As provided by New Road’s Chuck Romanoli, to all attendees of the private November 14th construction meeting. Not actually altered, rather one of the many drafts considered by Epic and other contractors before the final version was submitted. Below is the second page of the draft, which is the only page that contains any differences with the original/final version. The two critical recommendations are missing from this version, replaced with a single non-urgent recommendation that “these areas must still be isolated for safety and general air quality concerns.” Synatech President Todd Nugent, an asbestos expert and high school parent, believes this was a deliberate effort to deceive.